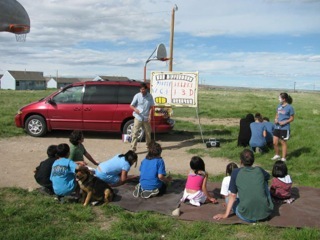 You will join a local church and help host a four day Bible camp in the heart of the reservation. You can expect 30-50 children and teens a day from the Ethete area to join your team at your partner church. This is a chance to provide substantial manpower, youthful energy, and a lot of Jesus to a successful Bible camp right in the center of the Wind River Reservation. You’ll visit two nearby housing neighborhoods to invite the kids. You might meet their parents, brothers, and sisters as you pick them up and drop them off each day. Evenings will be dedicated to getting to know these families and displaying the love of God to their community.